I recently posted this in another thread but since it directly relates to this thread I will put my two cents in here. 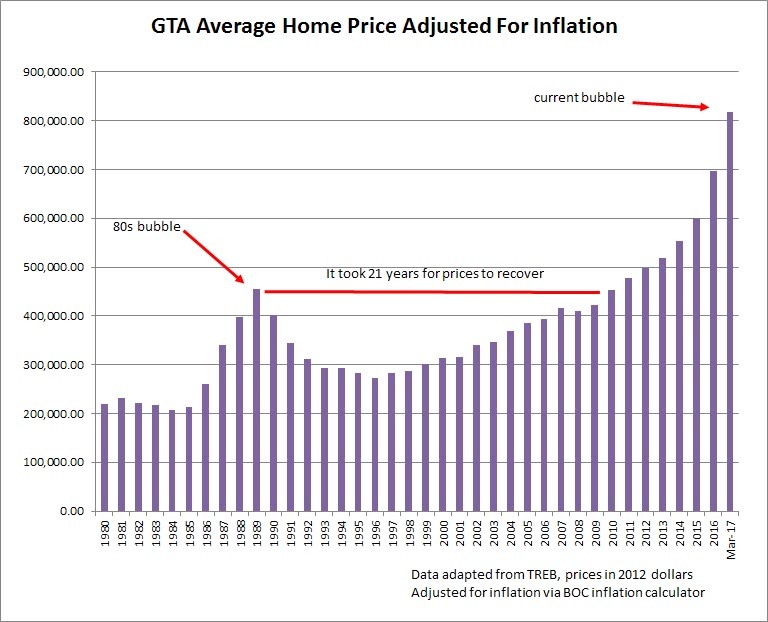 This thread started with Garth Turner’s statement ... “The big real estate bubble about to burst in Canada”. Many board members agreed and believed the collapse was imminent. However, that statement and this thread originated in February of 2012 - SEVEN years ago. Certainly nothing has collapsed since then. At this point, even if it does collapse, will property prices drop to pre-2012 levels? I am glad I haven’t been sitting waiting for the collapse to purchase a new home. Why hasn’t the Canadian market collapsed? The first U.S. city on the list is Honolulu. But you won’t find it until you get to number 26 with an average home price of $800,000 U$. And in Hawaii you don’t have the expense of building for well below zero temperatures, nor do you have to battle winter conditions during construction. In other words - it ain't cheap to build in Canada. As Canada is relatively welcoming to immigration, the laws of supply and demand kick in. Remember housing prices are only expensive in relation to one’s personal wealth. What may be expensive to me may well be cheap to an immigrant with a few hundred million in their back pocket. I am involved in the construction industry and most people have no idea of the extent of the wealth some of these people immigrating into our country have. Most of the people I encounter are looking for real estate as a relatively safe haven for their money. Had a older lady newly arrived from Iran come in recently doing some home renos. She asked if I knew of anyone who might have an apartment for sale. “Are you thinking of selling your house and looking for an apartment?”, I asked. But that pales in comparison to some of the Asian money we see. And we are a relatively small place. It also seems that many investors from outside Canada don’t understand that, unlike the US a decade ago, a lot of our mortgages are in effect government guaranteed through CMHC, others require a substantial down payment and in general our mortgages are not non-recourse loans. You can’t throw your keys on the banker’s desk and just walk away. So a correction in housing prices certainly would effect the economy, but not likely to the extent we saw in the U.S. meltdown of a decade ago. While our economy certainly has its problems, this is still not a bad place to live - and you don’t have to look far to make a comparison. We also have an upcoming election that may show an improved change in direction should a new government realize that there is more to Canada than the two central provinces. Could housing prices collapse. Certainly anything can happen. But I would think twice about putting off buying a house for that reason because the bottom line is that unlike your stock portfolio, you can live in your house. The geographic footprint of the lower mainland in BC features an ocean to the West, a border to the South, and mountains in the North and East which all limit expansion. New construction features high rises these days in an effort to house more people on the same amount of land. It’s land values therefore that have become valuable. And while there is lots of talk in the press about the new speculation tax there is less discussion on things like Strata legislation changes. Changes in strata legislation now means winding up a condo building no longer requires a 100 per cent vote from owners and the City of Vancouver has seen a flurry redevelopment applications. High demand for the land and relatively fixed supply. But the supply is not so fixed if you consider that people have options--they can move to much cheaper Canadian cities. From what I have read #2,#4,#5,#10 on that list are all currently experiencing housing corrections/crashes. Interest rates have been abnormally low for over a decade. These predictions were based on the idea that rates have to normalize. It remains to be seen what will happen in a higher rate environment. The only thing drawing this wealth to Canada is the lack of money laundering laws and regulation, if that ever changes the wealth could disappear as quickly as it arrived. Your list of crashes depends how far backward you are looking. Calgary is down big earlier than the rest of Canada because of oil prices, but things seem to have startes to stabilize here, and valuations on basically every metric are way more reasonable. Vancouver/TO are much earlier in the bubble deflating process. If you look at the Canadian housing market in USD, it had a pretty big correction since 2014. But the idea remains that Canadians haven't seen their incomes increase at anywhere near the rate that housing has increased, that the difference is made up of debt, and that the only way this debt can be serviced is because of very low interest rates. Something that can't go on will stop at some point. I've always said that I have no idea when it'll happen, and I'm quite happy not to have bought since I've both done better in the market than Canadian housing since, and since my assets have been in USD instead of CAD, so I've had a double dip. I've also learned a lot about what I want in a house (having two kids does change a few priorities) and what neighborhood is best, so if I had bought back then, I probably wouldn't be happy with it now anyway and selling and buying has huge friction and headaches that I'm glad to have avoided. I've always said that I have no idea when it'll happen, and I'm quite happy not to have bought since I've both done better in the market than Canadian housing since, and since my assets have been in USD instead of CAD, so I've had a double dip. Not sure which region you are in, but this is hard to believe considering that the housing investment would have been most likely leveraged...plus the tax exemption you'd get for the principal residence. I'm near Ottawa. We'd have paid for most of the house with cash, so not much leverage involved. I think the topic raises an interesting question. Leaving aside the intangible value that a "home" can have, choosing which opportunity to invest in and the leverage aspect can be handled as a two-level decision but taking the two decisions together, one could argue that it was (in 2010-2) relatively easy and cheap (leverage aspect) to buy a house using a significant amount of leverage (ie 3:1 or 4:1 debt to equity). The interesting question is what would one do today in Toronto with a sum of money to "invest". I think a fair comparison would be to assume that you would have made enough downpayment such that your monthly mortgage + tax + upkeep etc. equals the monthly rent for a similar house. Then you can compare the return on that downpayment. Based on my rough calculation, in Toronto, you'd have made like 10x the original downpayment if you bought 10 years ago and sold now. Comparing that vs. investing the original downpayment in S&P, despite its good returns, it's not even close. And if it was your principal residence and you could have invested in S&P only via non-tax sheltered account...well that's another 2x in favor of buying the house. If you assume you would have bought the house entirely with cash, you should assume that the money you'd have saved from monthly rent would be invested in the stock market and aggregate that return with the return on the house. Not sure which option would have been better in that case -- but it seems extremely silly to not have taken the mortgage with the low-interest rates for past 10 years. Of course, this is all in hindsight. Going forward, investing in any real estate in Toronto does seem crazy right now. However, if it's your principal residence, I'd say just buy it with the mortgage if your total monthly expense on the home does not exceed 30-35% of your after-tax income (and it's not like rent is cheap in Toronto either). I really think nobody can predict what's going to happen to the market in the short term and over the long term you will do fine considering the relatively cheap leverage and tax exemption. Lots of hindsight bias here. If the Canadian market had crashed during that period, there would be a lot less celebrating, especially because when you're this elevated, nothing says you'll bounce back anywhere close any time soon (took around 21 years after the last toronto RE crash). I mean, I know this time is different and it can't possibly happen again, but what if? Financially, a house is valued the same way that we value a bond; PV of future benefits. When interest rates are high the PV of those future benefits is small (house is cheap); when interest rates are low the PV of those future benefits is large (house is expensive). Change usage, and you change the benefits, further altering the calculation. Leverage the asset (mortgage) and you magnify the PV change in benefit. In the 1980’s it ranged from 12-14%, spiking at 21.94%; from 2008 it has fallen from 5% to the current 3.84%. The usual mortgage amortization term is 25 yrs. For illustrative purposes, make up a monthly payment; and discount it for 25 years at each of the above mortgage rates. The 1980’s house price is very low, the 2018 house price very high, and the average house price is ‘in between’. Divide by the average house price to get a sense of the impact neccessary to return to 'average'. Of course, todays housing market should fall as interest rates go back to 6.9%. But we have no idea how long it will take for rates to rise another 310bp, and we know that the price for an individual property will be determined by supply/demand at the time of sale. If nobody wants your place, you’re not getting the price you want. At current debt levels, how many people around you would still be able to pay their floating rate mortgage if rates were 300bp higher? They need to sell before that occurs, and move to something smaller with a smaller mortgage. The price of the $1M McMansion falls as everyone sells, and the price of the 500K townhouse rises as everyone buys one. The houses remain, with different people living in them, but the process takes a very long time. No crashes. Boomers owe their wealth to their ability to have bought a house in the mid 80’s, and finance it with a mortgage. 25 years later that house was worth many times what was paid for it, the mortgage was paid off, and the gain on sale was tax free. And every year of those 25 years, interest rates fell, continuously spurring the economy, and ensuring that you remain employed. And if you were a ‘bank’ employee you did even better, with ‘below market’ mortgages as a perk. If you’re < your mid-40’s today, this isn’t your life.